Most homeowners don’t like the look of their exterior HVAC units. This bulky, industrial-looking equipment typically doesn’t blend well with the charming landscape around the house. All you want to do is to cover it up. Even though throwing something over the unit isn’t an option, there are several ways you can disguise it to make your home feel more comfortable. 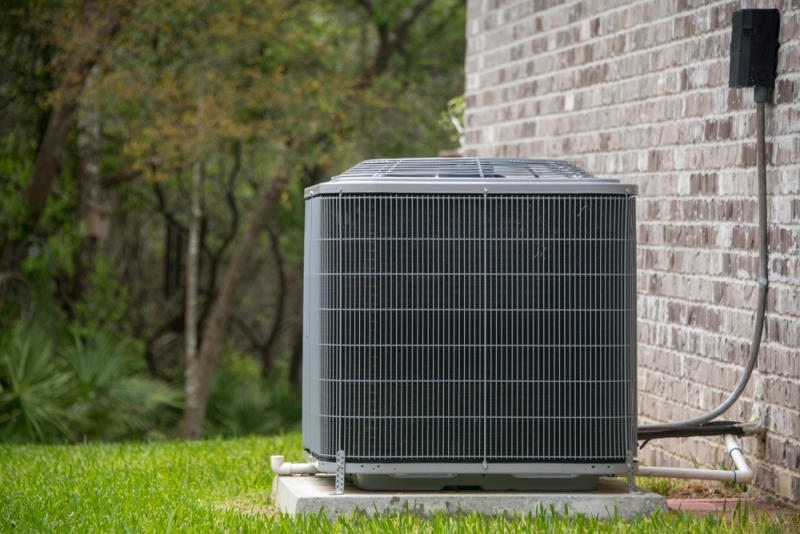 Whatever route you take to improve the appearance of your HVAC exterior parts, you must provide adequate clearance to preserve the unit and help it run efficiently. Maintain 2 to 3 feet of space around the unit and at least 5 feet above it to allow air to circulate and to prevent overheating. Make sure to leave at least one access point so that service technicians can get to the unit easily. Having an exterior HVAC system requires a more consistent and mindful landscaping routine in order to prevent accidental damage. Landscape carefully: Avoid hitting the unit or getting any debris inside when mowing the lawn. Anything that gets inside the unit can dirty the coils and damage the fan. Also, it is easy to damage the components by getting too close with your electric trimmer. Try to pull weeds around the unit by hand, and carefully trim the shrubs with shears. Keep the unit clear of debris: Try to trim back the plants around the HVAC system so that leaves and flower petals won’t get inside the unit. Placing a fence or screen around the unit to hide it from view. Having this structure in place will also provide shade, improving your unit’s efficiency by helping it run at a lower temperature. Additionally, the fence or screen will block some of the noise the system makes when running. For a more natural look, you can build a wall out of bricks or stone. If you make the wall or fence higher than the unit, you can use the area around as storage space for gardening tools and supplies. You can also block the view with attractive shrubs or trees. Look for evergreens that will provide the coverage all year. Make sure that the plants are hearty and won’t wither from the warm air coming from the unit. If your unit is old or rusted, consider painting it so it looks fresh and blends in with the landscape better. Check with the manufacturer if it is safe, and only use appliance paint that’s designed for outdoor use. By taking on one of these DIY projects, you can hide your HVAC unit and make the landscape a lot more appealing to the eye. If you want help disguising your HVAC unit safely and beautifully, consider consulting with landscaping professionals.